For the 439,000 people living in and around Mesa, Arizona, there are several funeral homes in Mesa to choose from. Funeral homes in Mesa are located across the city, though several are located close together between Highway 60 and East University Drive. Due to the diversity of the city, Mesa funeral homes provide a wide variety of services. Many funeral homes provide Catholic and Protestant services and burials, and there are many funeral directors who offer bilingual funeral services for the Spanish-speaking community. There are many Christian churches located around Mesa. For people of Muslim faith, there are the Masjid Abubakar and Masjid Noor mosques, with other mosques located in nearby towns that can assist with funeral arrangements. For those of Jewish faith there are two synagogues located near Mesa. One is Temple Beth Sholom of the East Valley, located in Chandler, and the other is Temple Emanuel, which is in Tempe. Funeral homes can work in conjunction with religious centers when arranging the funeral service. There are 12 cemeteries located near the city and for those who choose cremation, many of the funeral homes also provide cremation services. Throughout Mesa, there are several beautiful cemeteries available including Mariposa Gardens Memorial Park, Lakeshorer Mortuary, and Melcher Mission. 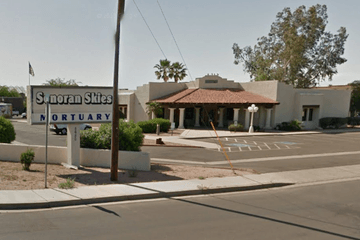 Those locations also offer cremation services, as do several mortuaries throughout Mesa. Arizona state law requires embalming or refrigeration if the burial or cremation is not going to take place within 24 hours of the death. Your funeral director will assist you with any questions or concerns you may have. Search now to find local funeral homes in Mesa near you. You can organize results by best rated, most reviewed or nearest to quickly and easily compare funeral homes. You can read independent customer reviews, discover more about the services they provide, and get in touch to begin making funeral arrangements for your loved ones.